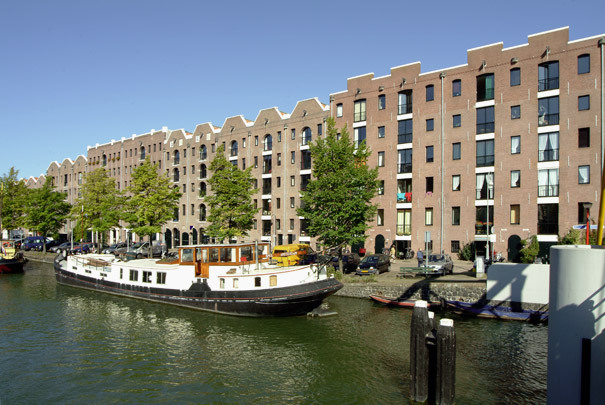 Oud Entrepotdok, consisting of 84 monumental bonded warehouses built between 1708 and 1829, has taken on a whole new lease of life as an apartment complex for social housing. Level one of the deep block now comprises parking and storage, level two commercial premises. On all further levels, which contain housing, the heart of the block was removed so that the flats at both back and front would receive sufficient daylight. The facades and the old timber floors and roofing have been retained wherever possible. The space directly below the monumental timber roof now contains studio houses and group living units.